The way that tetanus neurotoxin enters nerve cells has been discovered by UCL scientists, who showed that this process can be blocked, offering a potential therapeutic intervention for tetanus. This newly-discovered pathway could be exploited to deliver therapies to the nervous system, opening up a whole new way to treat neurological disorders such as motor neuron disease and peripheral neuropathies. The research in mice, published in Science and funded by the Medical Research Council, shows that proteins called nidogens that coat cell surfaces are key to tetanus neurotoxin entering the nervous system. Tetanus neurotoxin sticks to nidogens on nerve cell surfaces, and is then 'shuttled' into these nerve cells where it spreads and causes damage across the nervous system. Although an effective tetanus vaccine is available, no targeted treatments currently exist and until now it was unclear how the toxin entered the nervous system. The latest research not only explains how tetanus neurotoxin is able to enter the nervous system, but also why it is so toxic even in small quantities. 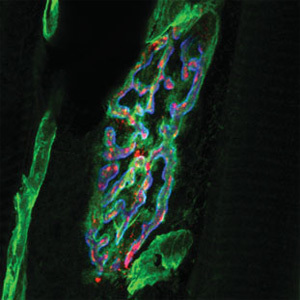 "The nidogen coating around nerve cells acts like fly paper, attracting tetanus neurotoxins to cluster around them," explains first author Kinga Bercsenyi, of the UCL Institute of Neurology and Cancer Research UK London Research Institute. "This explains why tetanus neurotoxin is so poisonous even at low doses, as it largely concentrates around motor neuron terminals, which are surrounded by high levels of nidogens." The discovery opens up the possibility of delivering drugs into the nervous system by exploiting nidogens in the same way that tetanus does. Similar to virotherapy, a growing field in which modified viruses are used to deliver drugs to specific cells or parts of the body, the latest research offers a new route through which therapies could be delivered. "Treating neurological disorders is incredibly challenging, and finding a way to get therapies to motor neurons is half the battle," says senior author Professor Giampietro Schiavo from the UCL Institute of Neurology, who led the study. "Now that we understand how tetanus gets in, we hope to mimic the mechanism to deliver advanced therapies. "There are virotherapy approaches being developed to target motor neurons, but methods that rely on creating new routes into cells can cause damage. Our discovery should complement virotherapy, as protein engineers could design molecular shuttles that bind to and enter motor neurons in the same way as tetanus. The qualities that make tetanus such a powerful neurotoxin could help us to develop targeted treatments for patients with some of the most debilitating and paralysing conditions. "These results provide a paradigm shift in our understanding on how natural ligands like growth factors and infectious threats such as pathogens access our nervous system. We have now shown that the matrix around neurons plays a major role in cell entry, offering a new route for delivering treatments. This discovery will help us to develop better treatments for motor and sensory neurons that concentrate in the right place, making them more effective at lower doses and reducing side effects."